Please join AskAmma in congratulating Chetana Amma for completing the training to become a certified La Leche League Leader. La Leche League, an organization founded more than 50 years ago when breastfeeding rates had dropped close to 20% in the United States, has helped many millions of families get adequate information, technical, emotional, social and political support to defend the time, space, nourishment and respect for women’s bodies that improve our confidence and enhance our ability to breastfeed. My mother was a member and I saw the difference it made for her and for my sister. I too benefitted from the personal support of a La Leche League leader when I experienced difficulty with latch-on in the first days of my daughter’s life. In India there are communities where women have been breastfeeding for generations, with plenty of support from their families and neighbours. Increasingly however, women are finding themselves without critical support for breastfeeding in the time of need. Breastfeeding rates are dropping in urban as well as rural parts of India. La Leche League and various forms of mother-to-mother support have a crucial role to play to help women initiate and exclusively breastfeed for at least six months and continue for at least two years as recommended by the World Health Organization. At the policy level, all of us must insist that pregnant and lactating mothers receive adequate rations as provided by the Integrated Child Development Services and know that they are entitled to maternity leave and nursing breaks as guaranteed by the Indian Constitution and the Maternity Benefits Act. We must also protest false advertising that undermines real food and breastfeeding. In a world that increasingly devalues women, women’s bodies, breastfeeding and food while at the same time pushing packaged and mechanized alternatives with false claims of health, happiness and women’s empowerment, La Leche League is one organization that makes a critical difference to the lives of women. Chetana’s article about her own experience with breastfeeding, which involved seemingly insurmountable challenges at first and yet is going strong even today, touched a number of families and gave strength to many women to continue breastfeeding and seek out support when they needed it. She also reaches out to women in neighborhoods of Bangalore that have little access to lactation support and advocates for their right to food and children’s right to breastfeed. With Chetana’s leadership I am confident that the compassionate embrace of LLL will reach communities hitherto unreached. To Chetana I say, congratulations and go forth with strength and courage. We are all with you, Chetana! Next How can I help my baby sleep at night? Thank you for writing this Aravinda. And thank you for standing by me, you have been a great source of inspiration. In the beginning of this year I was quite convinced that I need to get some kind of a certification and increase my knowledge about breastfeeding. Since I am full time mother, I wanted to do something that will give me the flexibility to care for my family and pursue what I wanted. I searched the internet and spoke to various Lactation professionals to figure out the perfect course. While there are a quite a few good online courses to choose from, the Leader accreditation from LLL stood out in so many ways. This is a voluntary position, where a mother is helping other mothers and at the same time learning from their experiences. I was in agreement with their philosophy of mothering through breastfeeding. I too believe in empowering women with information and letting them decide what is best for their babies and families. So, this was it! 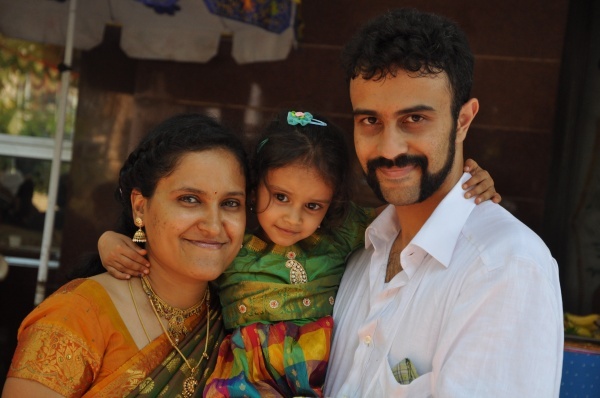 I was fortunate to connect with another mother Adhunika who started the Breastfeeding Support for Indian Moms, a very active and informative Facebook support group. She put me in touch with the right Leader in LLL who could help me take my dream forward. My support Leader who helped me with my application, is from Maryland US and she is a very kind, helpful, supportive person (nothing less could be expected from a LLL Leader). She patiently answered all my questions and guided me through the application process. It was quite an enjoyable experience and for the first time in my life I was “studying” about something that really, deeply interested me. I started the application for Leadership on 22nd May 2014 and got the accreditation on 31st October 2014. I am quite proud that I could follow through and finish it in 5 months. If anyone else is interested in becoming a Leader, I suggest that you read this -http://www.llli.org/lad/talll/talll.html to figure out if this is indeed right for you. Please do email me at chetuk3@gmail.com and I could put you in touch with the Leader who can help you take it forward. I hope to do justice to this title. That’s it for now, need to plan for the first of the many mother-to-mother meetings.